He holds an M.A. in theatre studies from Freie Universität Berlin, where he recently defended his Ph.D. thesis on contemporary pansori. He has been living in Seoul since 2010 and currently teaches as an assistant professor at Sungshin University. He conducts research on Korean theater and music, recently contributed articles to The Routledge Handbook of Asian Theatre (2016), and translated Korean theater plays. In addition, he coordinates the “Asian Composers Showcase” for Goethe-Institut Korea. Besides pansori and changgeuk, he is particularly interested in the role of traditional arts today, as well as in the transcultural interweaving of performance practices. He reports on theater, music and art in Korea on his English-language blog seoulstages.wordpress.com. Creutzenberg organized the symposium “Pansori in Europe: Mediation and Appropriation” together with journalist and music curator Matthias R. Entreß for the Korean Cultural Center (additional support: Literature Translation Institute of Korea). 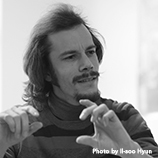 Jan Creutzenberg, researcher and expert on Korean theater and music, was one of the organizers of the international symposium “Pansori in Europe: Between Mediation and Appropriation”, that took place in July 2017 in Berlin. In this post, Creutzenberg reports from the conference sharing his impressions of performances and discussions about the intercultural transmission of the traditional Korean performing art pansori.